On the last track, we discussed the first two steps in the evaluation stage for dealing with an incident of internet bullying. These first two steps are, see the probable bully first, and identify concerns regarding the problem. On this track, we will discuss the third and fourth steps in the evaluation stage for dealing with an incident of internet bullying. The third and fourth steps are, gain the individual’s understanding of the situation, and explore the feelings of the individual being seen. The third step in the evaluation stage is to gain each individual’s understanding of the situation. Clearly, seeking empathy for the bully following an incident is vital, and this third step emphasizes the first aspect of empathy. The first aspect of empathy is understanding the content and happenings of the situation. I have found it useful to start counseling with events, rather than emotions, because what happened is often easier to explore and less emotionally charged than beginning with participants’ feelings. Remember Kasey and Laurie from the last track? I felt that if Kasey and Laurie could agree on the specific time the problem started, they would have something in common from which to work in joint sessions. Helping them reach this common ground would also allow me to pinpoint places that would need more attention in individual sessions. Laurie perceived the beginning of the problem to be Kasey’s first instant message. However, when I asked Kasey to describe how the problem began, Kasey stated, "It all started when Laurie just came up and shoved me in the hallway." Clearly, Kasey’s perception of the event was very different from that of Laurie, who reported that she accidentally bumped into Kasey in the hallway. I used the Gentle Leading technique to reflect directly on the content of Kasey’s statement, while conveying that I recognized things would not be this simple. I stated, "So this seemed to come out of nowhere? Laurie just came up to you in the hall and shoved you for no reason?" During this statement, I expressed my confusion in the tone of my voice and in expression, but did not directly question Kasey’s account. I feel that using the gentle leading technique allowed me to let Kasey know that while I believed what she was saying, it certainly sounded like an unusual situation. During the session, Kasey admitted she had had difficulties with other girls, but was adamant that the previous incidents had nothing to do with what had occurred with Laurie. To encourage Kasey to further explore the events, I stated, "So, there have been other problems, but you don’t think they are connected with this one. Maybe we should think about some of those other problems. A lot of times there can be similarities that might tell us something important, even when they are not directly connected. Maybe we should talk about some of those other problems that happened recently, or maybe even about other problems something like this one with other students." A fourth step in the evaluation stage is to explore the feelings of the individual being seen. After I had gained both Kasey and Laurie’s individual understandings of the situation, I scheduled additional individual sessions with both girls to discuss their feelings about the internet bullying that had taken place. As you have seen, Kasey’s perception of the events leading up to her internet bullying of Laurie was that Laurie had deliberately targeted and shoved her in the hallway. I invite Kasey to talk more about her feelings, I stated, "It sounds like Laurie shoving into you really bothered you." Kasey stated. "No, it didn’t bother me. Laurie’s just a jerk like all the other girls." I used a mild form of confrontation based on a conflict in Kasey’s own statement by stating, "I’m a little confused. You told me it was Laurie shoving into you that caused the problem, but what she did didn’t bother you. How do these things go together?" Kasey then stated, "Well, I mean I can handle it, but Laurie makes me mad and I had to put her in her place." To get a better picture of Kasey’s emotions, I asked, "What is this mad feeling like?" As our conversation continued, it became clear that Kasey was very bothered by the teasing she had suffered regarding her early physical development. She felt very pressured to hide the fact that she was bothered by always seeming "in control". My discussions with Laurie provided a very different emotional picture. Laurie was very ready to say that she was afraid of Kasey. Laurie also seemed to feel very isolated, despite the fact that I had observed several students showing her support. Laurie stated, "I just don’t think anyone wants to get involved and go against Kasey. She’s mean to a lot of people. I felt that I couldn’t go to any of the other girls for help, because if Kasey knew they were helping me, she’d hurt them to. So no matter what I did, it’d just make things worse." Clearly, both Kasey’s need for control and Laurie’s feeling of isolation would need to be addressed in future sessions. Think of your Kasey and Laurie. How did your exploration of their emotional perceptions of the internet bullying event compare to the techniques I used with Kasey and Laurie? On this track, we have discussed the second two steps in the evaluation stage for dealing with an incident of internet bullying. These second two steps are, gain the individual’s understanding of the situation, and explore the feelings of the individual being seen. On the next track, we will discuss the final step in the evaluation stage for dealing with an incident of internet bullying. This final step is to explore potential feelings as seen from the other participant’s point of view. 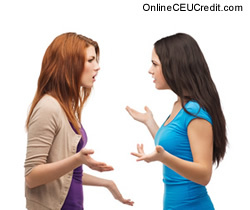 What are the second two steps in the evaluation stage for dealing with an incident of internet bullying? To select and enter your answer go to Answer Booklet.